a similar sister organization, The National Trust of Zimbabwe was established in 1960 by the National Trust Act with the same aim of protecting and managing properties for future generations to enjoy. Some of our properties are held in perpetuity so that their future protection is secure. The others are open to visitors and we are constantly looking at ways in which we can improve public access and on-site facilities. (d) to maintain or manage or assist in maintaining or managing lands and buildings for the purpose of public recreation, entertainment, resort or instruction. The National Trust act is assigned to the Minister of Environment, Water and Climate Change. 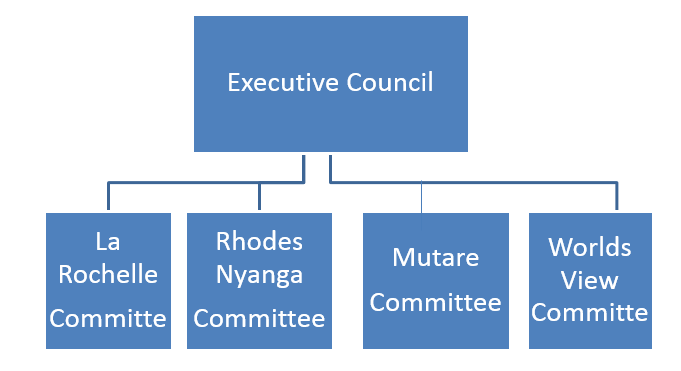 It is administered and controlled by a voluntary Council consisting of a President and not less than 10 or more than 20 members of whom not more than 18 are elected at an annual general meeting of members and three are appointed by The Ministry. A part-time honorary secretary and a part-time bookkeeper manage the NTZ’s headquarters in Harare. An external auditor is appointed with the approval of the Minister of Environment, Water and Climate Change and audited accounts are submitted to the Ministry on an annual basis. • Tourism – Accommodation, Event hosting (small conferences, weddings or company retreats), camping and caravanning, existence of the only Braille trail in Zimbabwe, for the enjoyment of partially blind people to experience nature. Sources of funding for the NTZ include rents, annual subscriptions, donations and gequests, admission charges to properties, hire charges for the use of halls and grounds, and the proceeds of sales of nursery plants and cut flowers. A part-time honorary secretary and a part-time bookkeeper manage the NTZ’s headquarters in Harare. An external auditor is appointed with the approval of the Minister of Environment, Water and Climate. Being a member of the NTZ has benefits both inside the country as well as around the world. The NTZ has reciprocity agreements with the National Trust of England, Wales and Northern Ireland and the National Trust of Scotland. In terms of our arrangements with these Trusts, members are entitled to free admission to all of the many outstanding National Trust properties throughout England, Wales, Northern Ireland and Scotland upon production of a valid National Trust of Zimbabwe membership card. This represents a considerable benefit to members of the Trust who visit the United Kingdom. Through reciprocal arrangements with the National Trusts in Guernsey, Jersey, Barbados, Ireland, Malaysia, Bahamas, Bermuda and New Zealand and with the Australian Council of National Trust’s, and the Stichting het Vrienden der Geldersche Kasteelen and Stichting het Geldersch Landscape in the Netherlands Trust members enjoy free admission to the numerous properties of the National Trusts in those countries. Please find the NTZ Audited Annual Account Report for the 2014 period.